Current solutions with 4K UltraHD resolution are ready to be implemented, but a careful approach to the choice of components and their integration is required. Every few years a new resolution standard enters the audio-visual equipment market. It usually has a compelling brand name and promises consumers something “like you’ve never seen before!.” Sometimes, the hype is just that: hype. These products are marketing clamor, and are often forgotten about immediately when another brand-new product enters the market. Sometimes, however, a new standard quietly delivers high-quality changes, and these products endure for a long time. The new generation of video equipment with 4K UltraHD resolution is one of those developments. It has a lot to offer users, but with a caveat — the new standard creates an absolutely different user experience for screens of different physical size. Let’s start with smaller UltraHD screens, such as laptops and desktop monitors, for example. They are affordable, but not ubiquitous. 4K UltraHD screens allow users to forget about resolution altogether. This is very important since the main disadvantage of liquid crystal screens is their attachment to their original resolution. If you try to work in any other resolution (even in lower resolution), you will see annoying artifacts from the image. The new standard shrinks the pixels on your personal screen to such an extent that you will never notice any blurring or distortion. It improves the quality of displayed fonts and, most importantly, allows users to easily scale interface elements depending on personal preferences. Unfortunately, it is that simple only in theory. In practice, the majority of software currently in use does not support 4K UltraHD. And this problem is not new; operating system vendors have unsuccessfully demanded support for this functionality for many years. As a result, they have to use various tricks: the conceptually scalable interface of metro/Windows 8 style, real and phantom resolution for Apple products. This is beginning to change, and over the course of the next two to three years, a fixed screen resolution will not be as important anymore. It will simply become sufficient enough, as previously monitor size and hard drive capacity did. Big-size screens (40″ and more) are a different case. In the past, those who viewed content from a distance of a meter or more didn’t have to worry about scalability problems, and forgot they were even an issue during the initial mass shift towards FullHD resolution. But if you come in any closer, the image will break up into pixels, and it is impossible to perceive it in its entirety. The new generation of resolution allows consumers to convert a screen surface into a convenient work area on which you can draw, type and combine elements. This “virtual whiteboard” offers users a fully featured alternative to blurry screens and a new, never-seen-before class of devices. In this case, the concept of a desktop reaches a whole new level. These virtual desktops act similarly to a real surface. Our eyes comfortably roam the space, focusing on one part at one time, while any instruments and materials you are not using at the moment stay at hand. It is quite possible that in a few years we will see new workstations consisting entirely of screen surface with touch input. Time will show whether this concept is viable. In any case, enhanced screen resolution will be a key component of such solutions. The 4K UltraHD resolution standard is not just about screens, but also about the equipment for content demonstration and creation. The current situation is more or less clear. 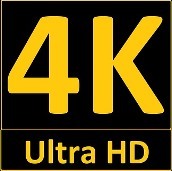 Support for 4K UltraHD resolution has appeared with some restrictions in version 1.4a of the HDMI standard in 2009. In version 2.0 (released in 2013), it became fully-featured. The integrated graphics of last-generation processors also support 4K UltraHD. This means there are no definitive complications with connecting 4K UltraHD equipment to modern devices, but the situation concerning Web cameras, video cameras and capture cards is not on par with advances in graphics cards. Good-quality compatible devices are hard to find and have some efficiency issues. This situation should improve by the end of this year, because the launch of new models compatible with 4K UltraHD have been announced. If we talk about cameras, at first sight everything is alright. Even small and unknown manufacturers announce devices with support for UltraHD resolution. In most cases, this unfortunately means that they have increased the image size without improving clarity. Fully featured 4K UltraHD requires an efficient resolution of at least 9 megapixels, and also optics of appropriate quality. Even leading manufacturers offer only a handful of camera lenses recommended for 4K UltraHD. It is nonsense to think that UltraHD resolution can be achieved with a tiny smartphone camera lens. All of us have already gotten used to “megapixel marketing” used to promote new photo cameras, but this is meaningless unless they are of sufficient quality to keep up with new video standards. UltraHD opens up new useful possibilities for video conferencing and streaming since you can choose a desired area of an image to show without panning or tilting the camera. But if we try to do the same things with a camera that has poor optics and a matrix with low physical resolution, we will only get an enlarged image full of artifacts. Besides, 4K cameras require higher speed of data transfer. While FullHD@30FPS can pass through USB 2.0 without many difficulties, 4K requires at least USB 3.0. To sum up, it is necessary to say that current solutions with 4K UltraHD resolution are ready to be implemented, but require careful approach to the choice of components and their integration. Within a few years, high-quality 4K UltraHD image will become routine. Users will not agree to watch video content in lower resolution; and 4K TV, PC monitors, and 4K UltraHD video conferencing software will become indispensable features of daily life.